All companies want to hold onto their best and brightest employees. 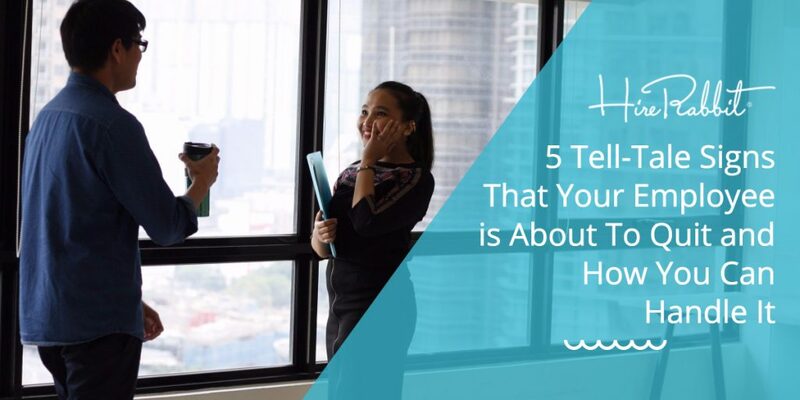 Finding and hiring a good candidate takes a lot of effort, which is why it is important for employers to do everything that they can to make them stay. But sometimes, it cannot be helped that great employees think of leaving, mostly for a variety of reasons such as higher pay, better career opportunities, flexible working hours, etc. Often, managers get overwhelmed and upset with the thought of losing an employee, that even with the slightest suspicion of quitting, they confront the person about it right away. The thing is, you don’t want to immediately accuse someone of job hunting or planning to leave because if it turns out to be untrue, it can damage your relationship with the employee. Sign 1: They start slacking off. From time to time, a staff member might become lazy to do some work tasks. But if you noticed that their work productivity has decreased more than usual, then maybe they’ve been less motivated to work and may be seeking new challenges outside of your company. You can try talking to the employee one-on-one to find out the reason for slacking off. Ask them what you and the company can do to motivate them and make them perform to the best of their abilities again. Sometimes, the employee just needs new challenges from within the company so they can feel driven again. Sign 2: They don’t cooperate anymore. Staff members who are thinking of quitting may act less like a team player than usual. They refuse to participate in work activities and beg off on task assignments. They express dissatisfaction from work and do not want to play their part in the team anymore. They could be suffering from a long-standing demotivation and are now at the verge of quitting. Each employee has a part to play in every company and if one doesn’t cooperate, it could affect the whole system. You, as the supervisor, should make sure nothing falls through the cracks when an employee refuses to cooperate. Talk with them to find out if there is any problem they are facing, be it personal or work-related, and offer help. You can also create some team-building activities to further stress the importance of everyone’s participation at work. Sign 3: They don’t care about what you think anymore. Employees who are about to leave are usually less interested in pleasing their manager than usual. They exhibit a negative change in attitude and belligerence towards work and towards you, their supervisor. Ask the employee for their feedback on your performance as a manager. Ask why they are displeased with you and offer some explanation if their points are valid. Hopefully, the employee will see that you are open-minded and you value their constructive criticism. Most people leave work at 5pm, but an unhappy employee typically leaves earlier than usual.. All day, they were less focused on job related matters and wants nothing more than to go home. Sometimes, employees who want to leave work early have pressing personal matters that they have to attend to. You can offer them flexible work hours or work-from-home scheme on some days of the week. This flexibility could be appreciated by a lot of employees, especially those with children. Sign 5: The don’t want to commit to any long-term projects. Employees who are about to quit have lost enthusiasm for the mission of the organization and do not want to commit to any task longer than one week. It may be because they found another job already or they just don’t want to committed to something they don’t believe in anymore. You can talk to the employee and ask why they won’t commit to long-term projects. You can offer additional compensation if they commit to a 6-month to 1-year project. You can also negotiate additional benefits, like more paid holidays, if the employee would prefer that. There could be many reasons why an employee would want to leave – low pay, negative company culture, stressful working conditions, etc. As a manager, your job is to ensure that the company doesn’t suffer from the bad effects of a team member quitting. In the end, it is wise to accept that everyone eventually leaves. You should plan ahead, be observant if any of your team members are showing these behaviours and take actions as necessary. Good employees are hard to find, so make sure you are taking care of their needs and interests to ensure that they remain loyal to your company. Do you know of any other tell-tale signs that an employee is going to quit? Share it in the comments section below.